Leftover pie you say? Yes, Pie! The reason why I upped my workouts this week. Burning more calories means I can have more pie…doesn’t it?! Pie is something I can usually pass up other times of the year (except for chocolate meringue pie-I’m a sucker for that). To me, pies are just meant to be eaten on Thanksgiving. I also love the fact that guests are so readily eager to bring pies! (My hubby practically begs someone to bring a cherry pie-his fav!) I’m not a big baker (too much measuring for me) so I graciously accept and eat the pies. I love people’s reactions to pies when the box lid is opened or the cake box lifted. Listen for the oohs and ahhs. I also love those that said they didn’t want any pie for they were way too stuffed, suddenly find plenty of room for a slice of pie…or two! Then the famous question is inevitably asked, “who wants the last slice of pie?” Say yes! 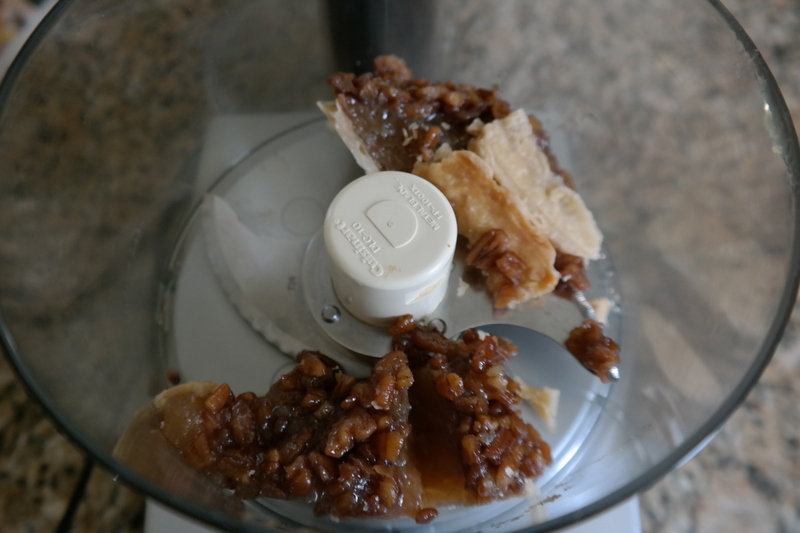 Put slice of leftover pie in food processor (Trust me!). I’m using pecan pie. But this works with just about any fruit or nut pie. 1. 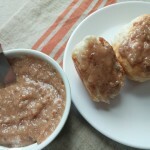 Mix into hot oatmeal. 3. 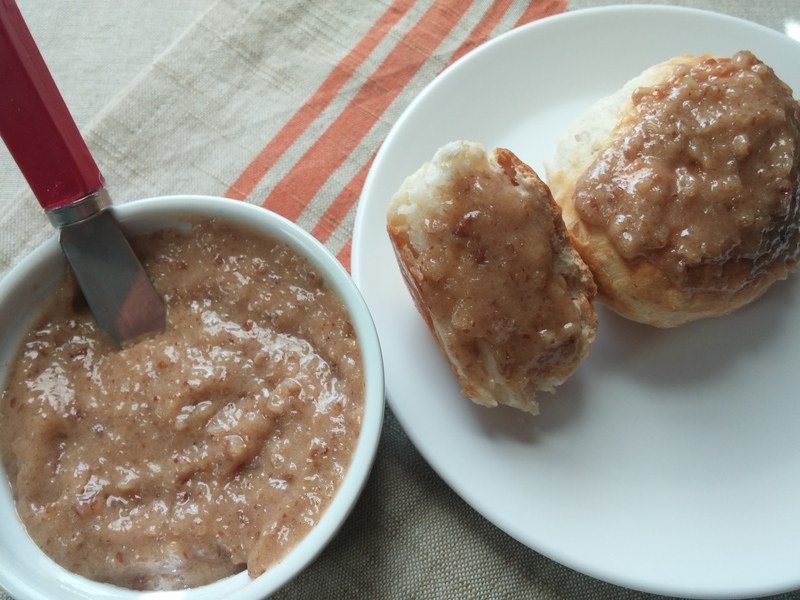 Blend with butter for topping on hot muffins. 4. Whip with cream to make frosting for pound cake or cupcakes. 6. Mix into pancake or waffle batter. 8. Use as topping for baked brie cheese. 9. 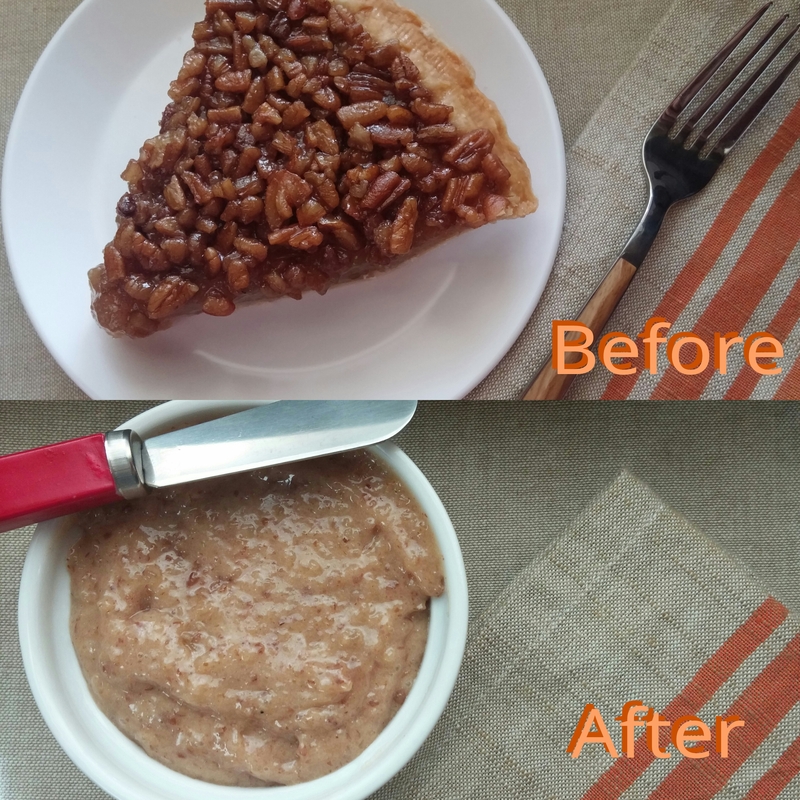 Leftover pecan pie can be pureed, mixed with brown sugar and chopped pecans. Freeze. 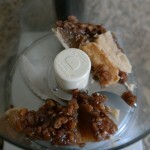 Use for crumble topping for your baked Christmas sweet potato casserole. I’m using chocolate cream pie with vanilla, chocolate, & caramel swirl ice cream. Works well with just about ANY pie! Here’s a quick guide, but amounts will depend on your preference for a thicker (more ice cream)or thinner (more milk) milkshake. 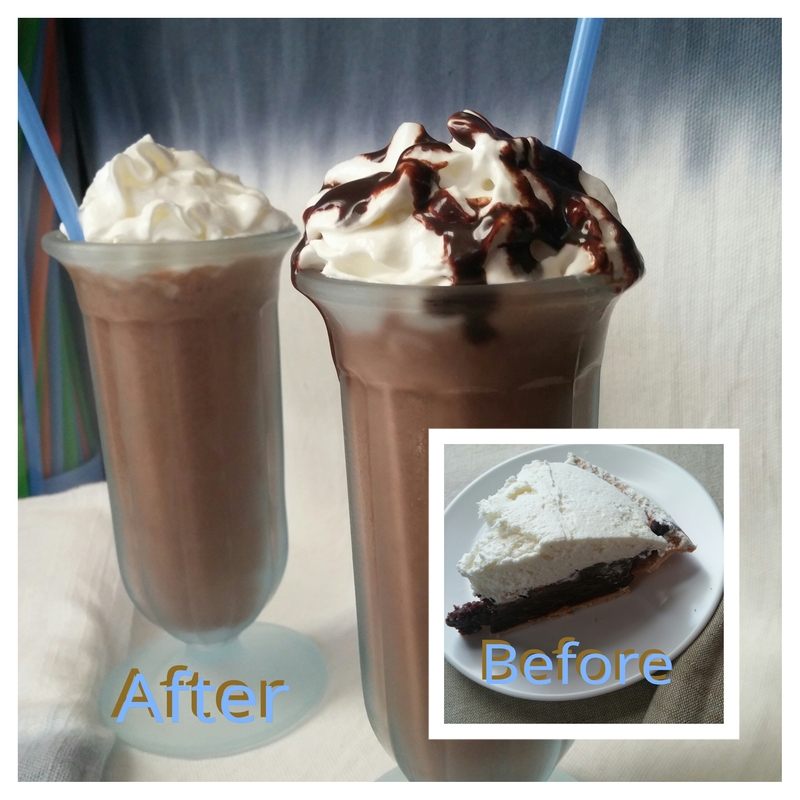 Put 1 slice of pie in blender. Add 3 scoops softened ice cream (let sit a bit to soften, not melt) and 1/4 cup milk. Process until smooth or until desired consistency. Top with whipped cream, optional. Finally, the most important step…put a straw in it & ENJOY! Put your To COOK is TO CREATE thinking cap on: Let’s talk milkshakes. 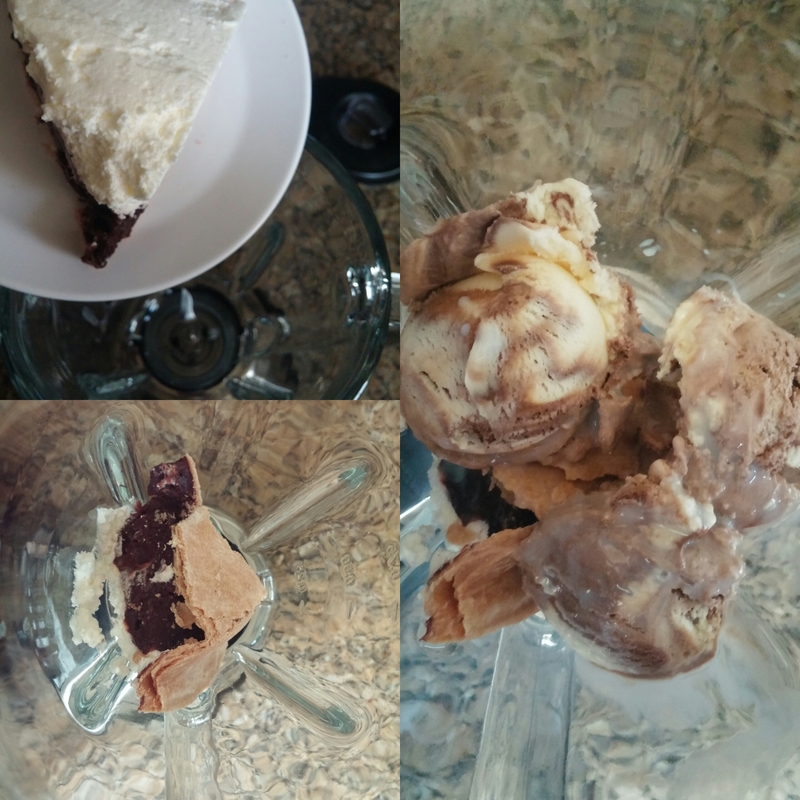 Think of how many different combinations that you can make with different pies and ice creams. Some thoughts to get you started: sweet potato pie & butter pecan ice cream; apple pie & caramel swirl; pumpkin pie & pralines and cream; pecan pie & chocolate fudge (like a chocolate fudge pecan pie!) What pies might go with coffee, cookies & cream, chocolate cookie dough, or mint chocolate chip ice cream? One I enjoy is pecan pie and french vanilla ice cream using eggnog instead of milk! Think about what else can be put in the blender with the ice cream, pie, and milk for added flavor-nuts, syrups, extracts, spices. The same is true when making the “pie puree”, think about what flavors would compliment the pie? Sounds yum! Thanks for idea! I do that to leftover fruitcake-rum ball style. Check out my 10 Uses for fruitcake post. Wow! Awesome! 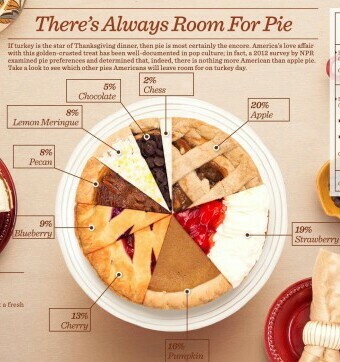 Will never look at last slice of pie the same way again. Thanks! Some great reasons to have pie for breakfast, too. Gonna have pecan pie pancakes for sure! 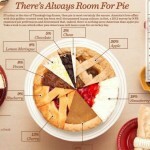 Did not know that Apple Pie is the most popular…by a thin margin. I am sure that all the pie will be eaten on Thanksgiving Day, so I am buying an extra one just to make some of your delicious treats. I had absolutely no idea what could appear from one lonely slice of pie. Everything sounds so delicious. I think that I will try the milkshake with cookies and cream ice cream….maybe even a little eggnog too. Look out next week for the dreadful workouts! Calorie overload for sure, but it is certainly worth it.